What a thrill it is to drink Mauro Mascarello’s 1987 Barolo Monprivato, a wine I have never come across before. Nineteen eighty-seven is not remembered as a very good year in Barolo, mostly because rain during harvest left many wines with light-bodied structures. 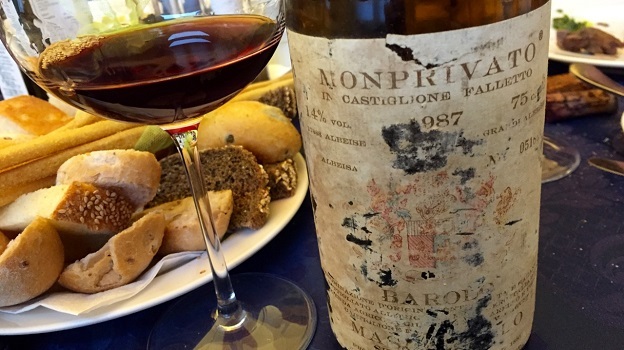 The 1987 Monprivato, along with Giovanni Conterno’s 1987 Barolo Monfortino, is one of the very pleasant surprises of the vintage. Surprisingly intense in color, the 1987 is impressive from the very first taste. A host of expressive balsamic notes lead to a core of sweet dark cherry, leather, spice, mint, dried flowers and chocolate. The wine’s inner sweetness and 14% alcohol point to a late harvest. Although dark in its flavor profile, the 1987 has plenty of balancing freshness and the classic Monprivato mid-weight structure. The 1987 is peaking today and, while it won’t last forever, it is a poignant reminder of the greatness of the Monprivato vineyard as interpreted by one of Piedmont’s most important and established wine producing families. This bottle was sourced from the cellar of my dear friend, Il Professore, who knows more about old-school, traditionally made Italian wines than anyone I know. 94/Drinking window: 2016-2026.